Click on a link to view a section. 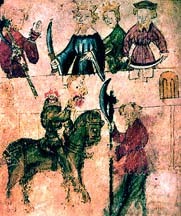 Sir Gawain and the Green Knight, a medieval poem, is part of the Arthurian legend. The author of this work is not known, and the work is considered to be the greatest of the Middle English romances. It is a poem about a Green Knight, his game, and a series of trials and tests for Sir Gawain. In this passage from part one of Sir Gawain and the Green Knight, the knights of the Round Table are getting ready to celebrate Yule when, before the first course of the meal, a knight rides into the dining chamber. The knight is completely green, as are his clothes and his horse. This passage describes the Green Knight, his attire, and his horse. This is the first time he is seen in the poem, and the poet uses great detail in describing him to us because his appearance is tied closely to the time of year, certain aspects of Yule, and ultimately to the plot of the story. We are presented here with a vivid depiction of the Green Knight. To begin the poet starts with his size. The Green Knight is described as "Half a giant on earth I hold him to be,/But believe him no less than the largest of men"(11-12). After the description of his size, the poet states that the man is all green. His hair, skin, clothing and horse are green. Green is also a color used to represent nature. The author is implying that the Green Knight is some type of forest or woodland spirit. This might also be the reason why he is wielding an axe as a choice of weapon. Because he maybe a spirit, he is immortal and therefore does not die when Sir Gawain hews off his head. This is further echoed in the Green Knight's apparel and saddle. Both his clothing and his saddle are embroidered with forest creatures in gold thread. The green motif is used during Yule when people decorate their homes with green (e.g., evergreens, mistletoe, etc.) to remind them that spring is not too far away. The author uses the fact that Yule time serves as a reminder of spring to echo the purpose of the Green Knight. The Knight's purpose is to remind Arthur and his knights that they are not perfect and are just as susceptible to corruption as anyone else. This is the ultimate point of the game he requests to play with Sir Gawain, in which time and time again, Gawain is tested by the Green Knight. The point of the game is never stated directly in the poem, but it is implied. It is brought to our attention by the author's use of the color green and the time of year. Ultimately, we dicover that the Green Knight is a creation of Morgan La Faye to bring distress to Guinevere and King Arthur's court. In the end, Sir Gawain gives into a temptation and is cornered by a trap in which he has two choices. Both of the choices will lead him into being dishonest. Gawain must choose between not giving the green belt he receives from the lady of the castle to the lord or giving the lord the green belt which will cause the lord to find out about Gawain wooing his wife. 007 and Sir Gawain and the Green Knight - 007 a modern-day knight? Sir Gawain - Sir Gawain: greatest of King Arthur's knights, or loud-mouthed, short tempered idiot responsible for the collapse of the Round Table? Lili Arkin, "The Role of Women in Sir Gawain and the Green Knight_" - The Role of Women in Sir Gawain and the Green Knight. Arthurian Graphics - Arthurian Paintings, Illuminations and Illustrations. Ed. M.H.Abrams. New York: W.W.Norton and Company, Inc., 1993, 200-254.